The concert will feature the world premiere of John Russell's Symphony for Piano and Orchestra: Bearable Pain, Unbearable Tenderness as well as Symphony No. 5 by Shostakovich. 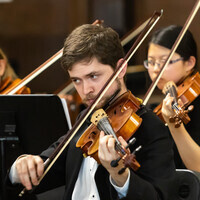 University Symphony Orchestra is conducted by Dr. Nicolas Waldvogel, Professor of Music at Pacific Conservatory of Music.